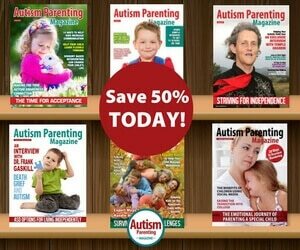 In the post we give a free mini issue of the magazine away. 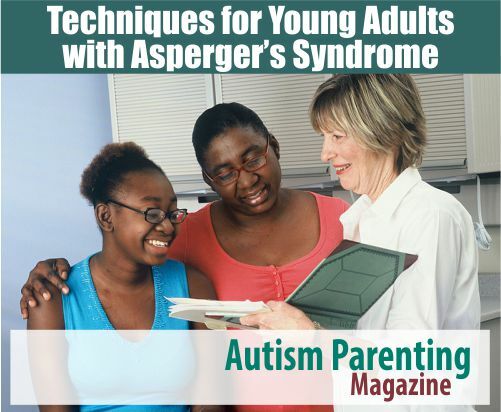 The article is written by Dr. Michael McManmon, Founder, College Internship Program (CIP) about techniques for young adults with Asperger’s Syndrome. 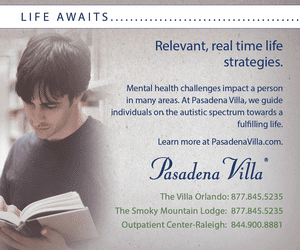 Young adults with Asperger’s Syndrome often feel overwhelmed by their first attempts at independent living. Attending college, making friends, and learning new skills can induce anxiety, forgetfulness, and disorder. To be successful, young adults need to acquire executive skills. Executive functions are cognitive abilities that control and regulate behaviors. These abilities are necessary for goal-directed behavior. Executive functions allow us to initiate and stop actions, to monitor and change behaviors and to plan future behaviors when faced with new tasks and situations. 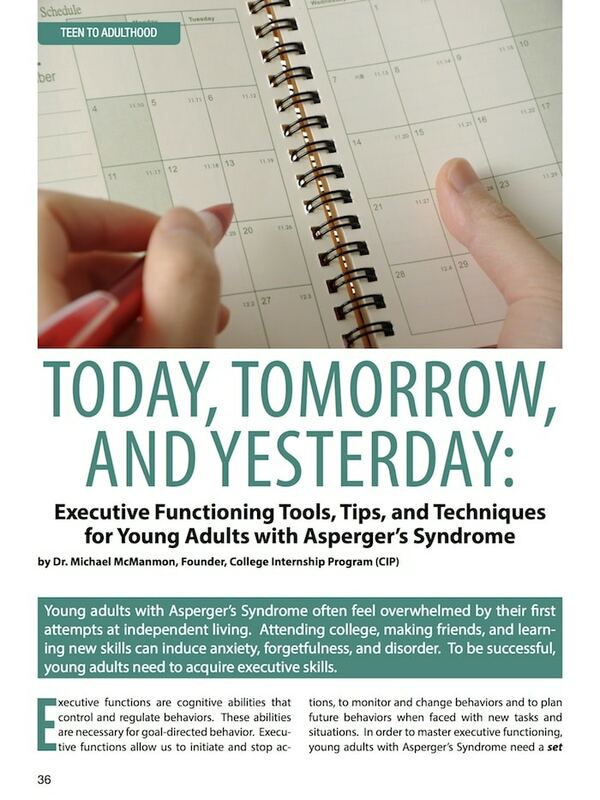 In order to master executive functioningg, young adults with Asperger’s Syndrome need a set of tools and training to conceptualize and think abstractly. I know from having Asperger’s Syndrome myself, the problems that develop because of poor planning or the inability to be on time. Without learning strategies to prioritize tasks and communicate effectively, a person cannot operate a household, a personal life, or a relationship. I recommend starting with the organization of personal living spaces. A system using color-coded bins to put shoes, clothing, and other items in, as well as checklists or reminders taped to the entrance of each room is effective, useful, and helps keep the young adult organized. Posting photos of what an acceptably clean kitchen, bathroom, and bedroom looks like provides an additional visual cue. Since many students with Asperger’s don’t have a good sense of time – basics to master time passing and getting a ‘sense of time’ by using a clock that has a red block showing time passing will help cement this concept. To organize personal routines, young adults can use cell phone reminders, day planners, computers, and watches with alarms, as well as visual schedules and checklists to prioritize tasks. I have a system for remembering things that work for me: I put notes in my right pocket and pull these notes out several times a day. If something is more important, I put the note in my shirt pocket where I will feel the paper through my shirt. If I absolutely have to remember something, I will write some initials representing it on my hand. This keeps me moving from one task to the other in order of importance. Michael McManmon, Ed.D. founded the College Internship Program (CIP) in 1984. He received a B.A. in English from Mt. St. Mary’s College in Maryland, a Masters in Counseling from Shippensburg University, a Masters in Human Development from the University of Kansas (through a grant from the National Institute of Mental Health), and a Doctorate in Special Education from the University of Nevada. Prior to Founding CIP, he worked for state, private and non-profit organizations in several states. During his 39 years of experience with students with Learning Differences and Asperger’s Syndrome, Dr. McManmon has worked on Curriculum Development, Staff Training, Program Evaluation, and Administering Community Based Programming. 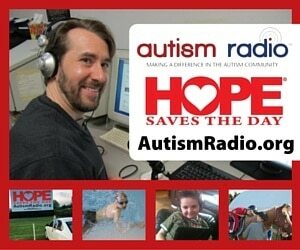 He speaks and presents at professional conferences nationally and internationally.